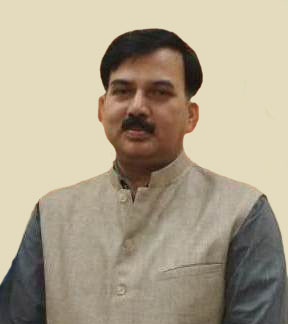 At present he is working as Dean (Acting) A&R & HOD (CSE). Dr. Shishir has completed his Ph. D. in 2005. His work area of Ph.D. was Load balancing strategies of Internet Servers. He has joined this organization in July 2005 as Assistant Professor. He has sixteen years of teaching experience in various organizations of repute for PG & UG courses of Computer Science & IT. Many students of various UG and PG courses of Computer Science and IT had developed their projects under his guidance. Nine scholars have completed PhD under his supervision; Namely, Dr. Satish Kumar Singh (IIIT, Allahabad), Dr. Mahesh Kumar (JUET), Dr. U.S. Rawat (Manipal University, Jaipur), Dr. Harikesh Singh (JUET), Dr. Amit Kumar (JUET), Dr. Prateek Pandey (JUET), Dr. Dinesh Verma (JUET), Dr. Ajay Kumar (JUET), Dr. Vinay Kumar jain. Five scholars are still pursuing their research for Ph.D. under his supervision. He is associated with many International Conferences as reviewer, Technical Program Committee member etc. To name a few are ICACT (IEEE Phoenix Park, Korea), SETIT (Tunisia; IEEE France Section), ICIECA (Harbin, China), AIC (Athens, Greece), SIGCOM (ACM Kyoto, Japan), MIC-CNIT (Jordan Amman), IEEE SMC (Texas USA) etc. He is also associated with many renowned International Journals as reviewer / editorial board member. He is also in panel of reviewer for IEEE Communication Society. He is also working as honorary advisor to SETEPS-India for various academic and literary activities. His professional interest area and teaching/research proficiency includes, Distributed Computing, Image Processing, Network Management and Software Process Management.